Thanks to Dinitools, the programming of the set-up and of the databases as well as the customisation of the printouts according to the customer specifications will be quicker and easier. Dinitools also simplifies the creation of new weighing systems and allows to quickly restore the original configuration. Clearing, Automatic Tare, Presettable Tare, locked, unlocked tare. Management of the main digital load cells available on the market. Storage of input/output weighs through ID CODE or LICENSE PLATE (up to 999 suspended weighs). 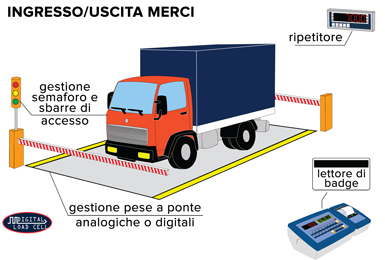 Management of second scale: possibility of carrying out the input/output weigh with scale 1 or with scale 2; input weigh with scale 1, output weigh with scale 2 and viceversa. Function "A+B" for displaying sum of scale 1 + scale 2. Thanks to the 3590EKR series indicator combined with a radio module, it is possible to manage up to 16 WWSRF platforms fitted with built-in radio module, with programmable databases and printouts. 15 configurable and printable ID texts containing 32 characters, i.e. : Code, lot ID, operator ID, shift number, etc. Database of 500 customers / 250 suppliers with two alphanumeric descriptions of 20 characters, input and output total, net total, weighs total. Database of 500 articles with alphanumeric description of 20 characters, input total, output total, net total, weighs total. Database of 500 vehicles with alphanumeric description of 20 characters, plate (10 crt), linked tare, input total, output total, net total, weighs total. Complete customisation of the function keys, for adapting the instrument to the needs of the user. 6 levels of totals zeroable and printable in an independent way: partial total, general total, grand total, customer total, article total, vehicle total. 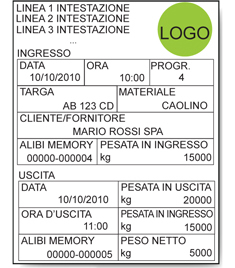 Printing of complete database reports or just the handled articles. Programmable printing from keyboard or from PC (through the free Dinitools.net software) of 30 print formats linkable to various functions (Print key, Input weigh, Output weigh, Single weigh, Partial total, General total, Grand total, Customer total, Article total, etc. ); each print format can contain 2048 positions which may be direct ASCII codes or preset print blocks (i.e. Company name, weigh and lot progressive, net weight, memory storage number, customer description, article description, date and time, etc. ).